Cabinet Ministers, State Ministers, Deputy Ministers, Members of Parliament, Diplomats, distinguished guests, ladies and gentlemen and dear children. I would like to express my most sincere thanks to H.E. President Maithripala Sirisena for inviting me to witness the destruction of 359 pieces of confiscated African elephant ivory weighing 1,529 kilograms here in Colombo today. Over the past 24 months we have seen countries within Africa, East and South East Asia, Europe, the Middle East and North America destroy stockpiles of illegally traded elephant ivory that has been seized and confiscated. Today’s event is the first destruction of confiscated ivory in South Asia and it is the first time that such an event has included a religious ceremony to honour the elephants that were killed, which makes it a truly unique and remarkable event. At the 16th meeting of the Conference of the Parties to CITES held in Bangkok in March 2013 (CoP16), CITES Parties spoke with one voice on the need to take decisive actions to stop the alarming trends in poaching and smuggling, especially as it affects the African elephant. These decisions have since been carried forward by CITES Parties, the CITES Standing Committee, and many others with a sense of urgency and there is now a global collective effort underway to combat illegal trade in wildlife. 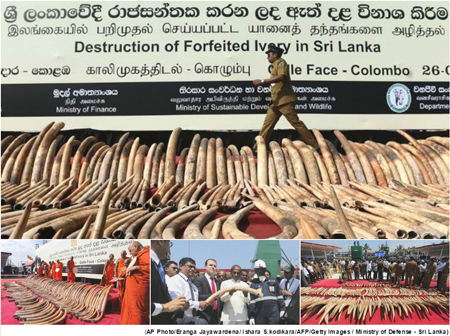 Today’s important event, being held in the presence of Ministers, Members of Parliament and the Diplomatic Corps serves to raise local, national and global awareness about the devastating impacts of illegal trade in elephant ivory and of the unwavering determination of Sri Lanka and the global community to put an end to it. It is also pleasing to see so many school children here today as protecting the world’s wildlife is an intergenerational responsibility. And today’s event comes just six months after the first dedicated UN General Assembly resolution on ‘Tackling illicit trafficking in wildlife’ was adopted by UN Member States and three months since the adoption of the UN Sustainable Development Goals, which include two specific targets on tackling illegal trade in wildlife. The international community has recognized that illicit trafficking in wildlife is not only having a devastating impact on the African elephant and other affected wild animals and plants, but it also poses a threat to people and their livelihoods – as well as national economies and in some cases national and regional security. It must stop and the international community is demonstrating an ever increasing determination to end this illicit trade, as was evident two weeks ago at the 66th meeting of the CITES Standing Committee held in Geneva, at which the Hon. Minister Gamini Jayawickrema Perera, led the Sri Lankan delegation. Distinguished guests, Sri Lanka was the first country to request the deployment of a Wildlife Incident Support Team (WIST) under the International Consortium on Combating Wildlife Crime (ICCWC), in response to a CITES Decision adopted in Bangkok in 2013. The WIST, which was led by our good colleagues from INTERPOL (for ICCWC), collected DNA samples from the 359 elephant tusks that were seized by Sri Lankan Customs authorities in the port of Colombo following the receipt of information from the World Customs Organisation. It is this contraband that is being destroyed today. The DNA samples collected by the WIST, through INTERPOL, represents best practice and what was done here in Sri Lanka has set the example for others to follow in ensuring that samples of seized and confiscated ivory are taken before such contraband is destroyed. This sampling1 has enabled national authorities to determine the origin of the seized ivory through the use of forensic technology. Identifying where such seized ivory originated from is vital for the design of efficient law enforcement responses and interventions across the entire crime chain, from countries of origin and transit through to the countries of destination. From the results of the forensic analysis of the samples taken in Sri Lanka, we now know that this ivory originated mostly from Tanzania and northern Mozambique. Through the good work of Sri Lankan authorities we also know it was intended to be shipped to the United Arab Emirates and transited through Kenya and Sri Lanka, where it was seized. It never made it to its final destination and we would like to respectfully commend Sri Lanka, its national authorities, and its partners for their extraordinary efforts in detecting this contraband in transit. The efforts of Sri Lanka, as a transit State, to intercept illicitly traded ivory and other illicitly traded wildlife is helping to combat these serious crimes and thereby protect precious wildlife assets in Africa and elsewhere. 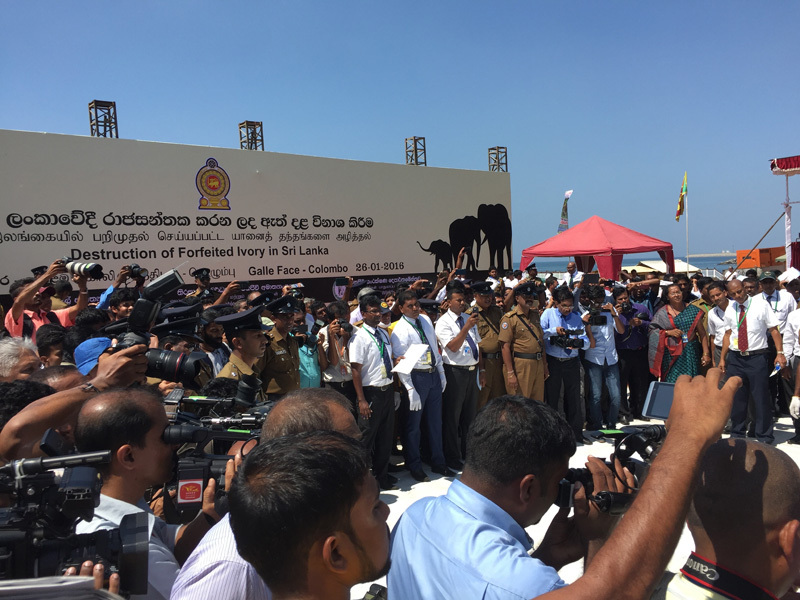 Distinguished guests, the destruction of confiscated elephant ivory in Colombo today will not in itself put an end to the illegal trade in elephant ivory. It is, however, ensuring that no one will ever profit from this contraband and, when coupled with the seizure of ivory and the prosecution and conviction of offenders, it sends a very powerful message that Sri Lanka does not and will not tolerate this illegal trade, and that illegal traders now face significant risks along the entire illegal supply chain – in source, transit and destination States. Today’s event also provides a very public opportunity to warn those people who trade illegally in elephant ivory that the age and origin of their contraband can now be readily identified through the use of modern forensics making prosecution and conviction much more likely. Trading in illegal ivory is shifting from low risk, high profit to high risk, low profit and today’s event sends a clear signal that illegally traded elephant ivory will not have any future commercial value. Distinguished guests, what was recognized by all of the Parties to CITES when they last met in Bangkok in 2013 is even more relevant today: reversing the disturbing trends in elephant poaching and ivory smuggling requires a sustained and collective international effort across the entire illegal supply chain that addresses both demand and supply. Today’s event, which fittingly coincides with International Customs Day, will serve to raise further public awareness about the devastating impacts of illegal trade in elephant ivory and other forms of illicit wildlife trafficking and the significant efforts being taken to combat it. We most sincerely thank H.E. The President for demonstrating Sri Lanka’s clear determination to put an end to elephant poaching and ivory smuggling, as well as other serious wildlife crimes, through today’s high profile public event. During the course of my visit to Sri Lanka this week, I have had the opportunity to met with many Ministers, senior officials and members of civil society and I have gained a great sense of a renewed commitment to wildlife, tackling illicit wildlife trafficking and to CITES, for which we are most grateful. It has been a great honor to be invited to participate in today's event. 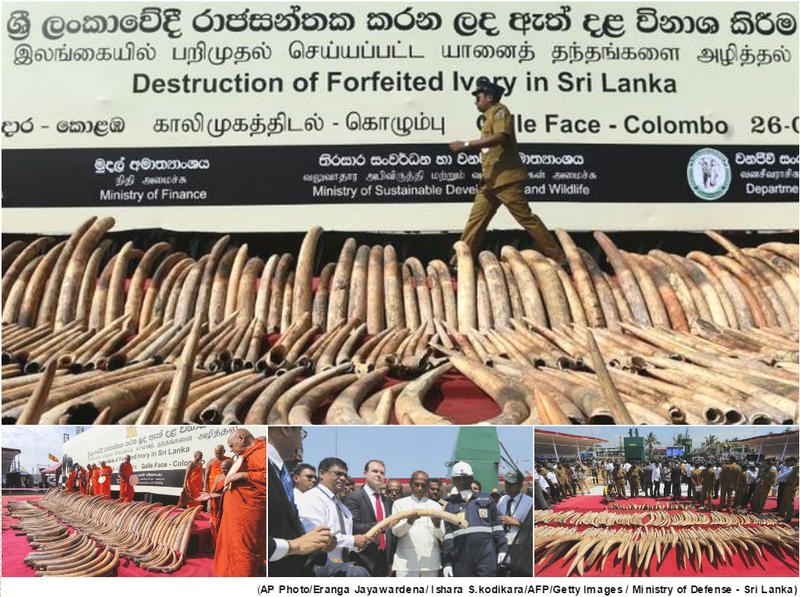 However, when a country, such as Sri Lanka, takes a decision to publicly destroy its confiscated stockpiles of elephant ivory, the Secretary-General regards it as presenting a unique opportunity to draw public attention to the scale, nature and impacts of the serious crimes that lie behind these confiscations and to act as a deterrent to illegal trade. The recognition of wildlife crime as a serious crime gained further momentum thought the recently adopted Doha Declaration at the 2015 UN Congress on Crime Prevention and Criminal Justice and through the adoption of the first UN General Assembly resolution on Tackling illicit wildlife trafficking. Over the past 24 months we have seen Belgium, Chad, China, the Republic of Congo, Ethiopia, France, Gabon, Hong Kong SAR China, Kenya, Mozambique, the Philippines, Thailand, the United Arab Emirates and the United States of America, destroy stockpiles of illegally traded elephant ivory that has been seized and confiscated. The samples that were taken were sent for analysis to the Center for Conservation Biology at the University of Washington in the United States for DNA analysis – to identify the origin of the ivory – and to the German Federal Agency for Nature Conservation for chemical isotope analysis, to determine the age of the ivory.